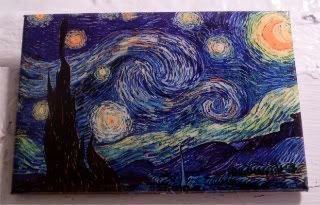 If you've never seen Van Gogh's Starry Night, get thee to the MoMA asap. It's lovely, this magnet doesn't really do it justice. Anyway, I love the swirliness of the sky, it almost feels like it's moving above the sleepy village below. Apparently, there are also somber overtones to the piece - those trees in the foreground, jabbing the skies and interrupting the movement of the stars, are actually cypresses, which are usually found in cemeteries. Hmph. Sometimes, I hate learning too much about the painting. I really kinda just liked it because of its deep blue color palette. The other reason I'm using it for today, is because the skies theme reminded me that the September 11th "Tribute in Light" is up and running in full force, and if you haven't seen those either, get here now. As someone Tweeted, it's easily one of the most breathtaking things to see around this time of year.